In this painting Rockwell tells the story of a little girl’s day by portraying small moments in her morning, afternoon, and night. It was created for the Saturday Evening Post and is a companion to Rockwell’s prior Post cover, Day in the Life of a Little Boy. Rockwell was known for his ability to capture emotion and tell a complete story within each of his images. Learn and explore words related to feelings. Printed or digital copies of “ A Day in The Life of a Little Girl” and “A Day in The Life of A Little Boy”. 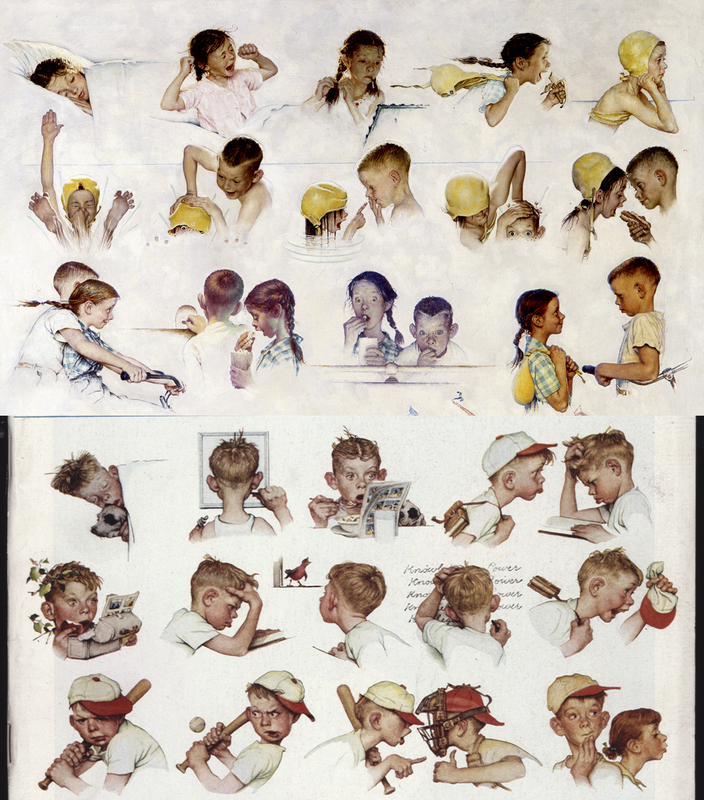 Day in the Life of a Little Girl(top), Day in the Life of a Little Boy(bottom), Norman Rockwell. What do you think he/she might be thinking? Use the images to explore emotions. Talk together about the fact that in one day, we might feel lots of different emotions. Go through each moment within the girl/boy’s day. Pause at each moment to ask, What do you think she/he is feeling? Follow with, How can you tell? Build children’s emotional vocabulary by teaching new words to describe the emotions. For example you might point to an image and say, The girl looks happy here. But in the next moment she looks really, really, really happy. A word for really, really, really happy is “ecstatic”! Now name an emotion and have children point to a moment in the illustration that shows that emotion. Later use these illustrations to help children talk about their own emotions. You might say, can you point to a part of this picture that shows me how you are feeling? Have students draw faces that show how they feel thought the day. You might choose certain times to have them reflect upon such as, how do you feel during lunch? How do you feel during recess? How do you feel during circle time? In small groups, have students reflect upon their emotions: At the start of the day, check in with children and ask: How are you feeling? How did you feel when you woke up? How did you feel after you ate breakfast? How do you feel about the fun things we will do today at school?